From the super-slim design of the Ultra Edition 8.4 which snagged an Editors' Choice to one of the earlier HSDPA-enabled Ultra Edition 13.8, the Korean chaebol has constantly been trimming the form factor of its Ultra series lineup. One of its latest introductions, the Ultra Edition 12.1 (U700), manages to pack a wealth of features including 3G and HSDPA into a slider that measures just 12.1mm thick. Describing the U700 as 12.1mm thick actually does the phone a lot of injustice. The U700 not only looks but also feels very thin. In fact, it resembles a candy-bar handset more than a slider. In the hands, this Samsung has a good combination of size and weight. One feel and you can tell it has a solid construction with the lid staying firmly in place when you slide it up. Unfortunately, we can't quite say the same when we retract it as there's a very tiny allowance to nudge the top lid from its position. Some, though will feel that's really a non-issue. When idle, the U700 is virtually a QVGA 320 x 240-pixel mirror, similar to the LG Shine KU970. However, the reflective screen washes out in the mid-afternoon sun. It is also a little distracting when sunlight reflects on it and we have to use our hands to shade the LCD when that happens. Sliding up the top lid activates the 2.2-inch LCD as well as the white backlit touch-sensitive shortcut and Call/End keys. These keys are rather responsive, but we still miss the reassuring feel associated with a raised button. With the touch keys, we had to look at the phone to know if the keypress was registered. What's unique about the U700 is the four-way directional control which doubles as a rotary wheel. It works like the one on the iPod except that this is mechanical. Although the alphanumeric keypad on this Samsung is flat, it is one of the better ones we've used so far. There's enough tactile feedback and we hardly had any typing errors while using it. A nitpick is with the volume keys on the left edge of the handset. We find it a little too low and too close to the headset connector. So when we plug in the supplied earphones, part of the connector would hover above the volume keys and obstruct its use. The U700 is one of those phones that manage to look fashionable, yet still pack a punch of features. The triband handset is equipped with HSDPA for fast data transfer and Bluetooth stereo (A2DP). It would have been a bonus if there's Wi-Fi, though. Onboard memory is limited to 20MB, but there's a microSD expansion card slot for the flash media. 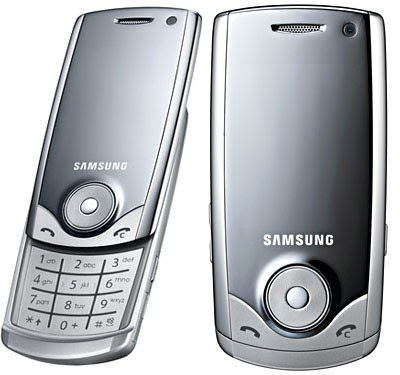 Looking at the user interface, the U700 is very much similar to the recent Samsung mobiles. Although it is attractive, it can be long-winded at times, requiring multiple presses to perform simple tasks such as sending a text message. Even with the nifty rotary wheel for scrolling, we still stuck with the directional control most of the time. Both worked fine, but clicking the wheel provided a more "precise" control over the speed of the scroll. For those whose memory is capable of retaining only the first few digits of their friends' mobile numbers, the search function on the U700 is a godsend. As we gradually typed out the numbers, the phone would show the contacts with corresponding digits so we could skip to the correct entry immediately. It's also helpful as a shortcut for those too lazy to go through the phonebook. The 3.2-megapixel autofocus camera gave us average-quality images. Honestly, we expected more. Our pictures lacked punch in the colors and tended to underexpose. The shutter button on the right edge of the phone had to be held in a horizontal position for a better grip. The usual settings such as flash, timer, color effects are organized under a shortcut tab, while other options such as metering and picture quality are in a separate menu. Thanks to this, it took us more keypresses to get to certain functions, which was frustrating at times. One other thing to note is that when shooting at maximum resolution, digital zoom is not available. Besides the main shooter, there's also a secondary front-facing camera for 3G video calls. We were rather disappointed the camera recorded video in 176 x 144-pixel QCIF resolution, which is unbecoming for a phone of this caliber. In terms of multimedia, the onboard music player was able to sort our tracks by artists, genres, albums, composers. We also had the option to create playlists. When the music was playing in the background, the artist information and song title would appear as scrolling marquees on the home screen. The rotary wheel actually made itself very useful here by making fast-forwarding or going backward a track a smoother process. Unfortunately on this Samsung, there's no FM radio. One thing the U700 can't handle is multitasking. For example, the music player would pause when we activated the camera. Fortunately, after we exited the camera, our music continued where we left off. Call quality was generally crisp and loud. However, volume dipped when we switched to the onboard speakers. Although this wasn't a major issue, 3G video calling when we were outdoors was trying as it was nearly impossible to hear what the other party was saying. The 900mAh battery life was decent for something that's so slim and lasted us just over two days on a single charge. Samsung rates the U700 for 3 hours of talktime and up to nine days on standby. Have this phone for 2 weeks now and it's a real stunner! Can't even recall how many people have asked me about the phone. Nonetheless, the user interface can do with some improvement. Touch buttons are built too close; really sensitive too. As are the wheels.